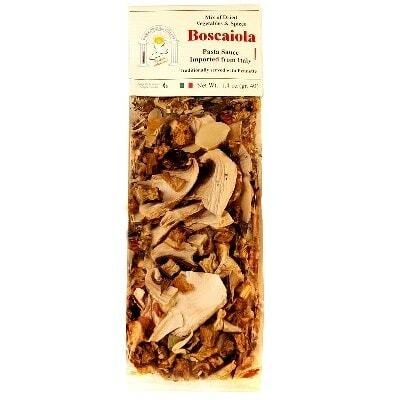 A bag of aromatic concoction, this Dried “Boscaiola” Sauce Mix is from jams and seasonings maker Paradiso dei Golosi. Perfect for making some great savory sauce, its name actually means “woodsman style”. You can use this to create savory sauces, especially if it’s with some extra virgin olive oil. Among its ingredients are bell pepper, eggplant, garlic, mushrooms, tomato flakes, onions, and an array of other spices. You can sauté this mix with extra virgin olive oil, add some tomatoes and pour over your favorite pasta. Or if you prefer, you can also serve the sauce over meat and slices of colorful vegetables. Prepare your favorite pasta dish with this savory sauce today. Grab a bag now!